TAITIEN Electronics, a technology leader in frequency control solutions, has introduced the new NN series of oven controlled crystal oscillators (OCXOs) capable of achieving tight frequency stability and superior phase noise performance. 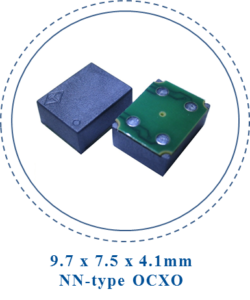 NN-type OCXOs, incorporating Taitien’s own patented Formosa ASIC technology, deliver best-in-class reference clock performance at industry’s smallest form factor at 9.7 x 7.5mm, which is ideal for applications such as small cell base stations, SyncE, IEEE 1588 PTP and network switches. Striving to deliver best value frequency control solutions to customers, Taitien has been continuously developing wide-range of crystal based timing products to address the diverse requirements in telecommunication and high-speed data communication markets. For further information about Taitien’s high-precision and low-jitter crystal oscillators, please contact TAITIEN sales at sales@taitien.com.tw. Samples are available upon request.